In the northern part of Bülach (Canton Zurich), Steiner AG is building a new urban district together with development partners Logis Suisse AG and Baugenossenschaft Glattal Zürich (BGZ). The visionary "Glasi Quarter" project demonstrates how high city-planning and architectural quality can be achieved – thanks in no small part to BIM. 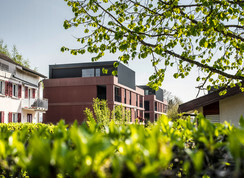 The 42,000 m2 Vetropack site (formerly the Bülach glassworks) is undergoing a transformation: over the next few years, a site on which glassware was produced for 111 years will see the birth of a new urban district comprising 512 apartments, a residential centre and care facility, a hotel and over 20,000 m2 of floorspace for light industrial and commercial undertakings. By 2021, the various squares, walkways and streets will be infused with new life. By Swiss standards, the new urban district in Bülach North will have a very high density. This presents a mixture of challenges and opportunities. A number of parameters will ensure a good quality of life despite the high population density. These include outstanding architecture, a well-designed transport system allowing for "encounter zones", public spaces, a variety of residential options, attractive areas to retreat to, and space for communal activities. Thanks to the broad mix of uses – the project encompasses not only rental and owner-occupied apartments but premises for artisans and other commercial activities plus offices and catering outlets, a hotel, a residential home with senior citizens' apartments, and a daycare centre – the new urban district will be an attractive place in which its future residents can live and work. The urban living spaces of the future should be technologically advanced and sustainable as well as efficient. 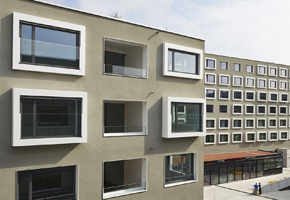 With its city planning projects such as "Manegg Mitte" in the south of Zurich and the "mehr als wohnen" cooperative residential complex in the north of the city, Steiner AG has shown how this can be done. And now Steiner AG is again demonstrating its innovative prowess and city planning expertise in Bülach's new Glasi Quarter. The flagship Glasi Quarter project combines innovative city planning with high living quality and state-the-art planning methodology: the whole design team is working according to the BIM (building information modelling) method. By joining forces with its experienced partners, optimising processes and exploiting the advantages of the BIM method, Steiner AG is bringing high design standards to the Glasi Quarter in Bülach that will serve as a beacon for future projects. The Maison de la paix in Geneva is not merely an impressive project from an aesthetic standpoint. Above all, it is a prime example of detailed planning and of a collaborative partnership between Steiner AG and the client IHEID. These are qualities which proved to be beneficial in various respects. Despite the high demands and exceptionally complex requirements, Steiner was able to optimise the project at various points, and to save costs. To begin with, the soft terrain was a big challenge. To solve this demanding task, Steiner anchored over 300 bored piles underground, extending down to depths of 20 metres. Steiner fixed a base to this pile construction, forming the foundation to the complex. Six building blocks were laid on top in a folding formation. They create the shape of petals. The structure of the entire complex comprises a suspended roof, supported by a tubular construction. The three-dimensional roof of the auditorium replaces six pillars, for example: a highly innovative and challenging building structure, demanding extreme precision and close cooperation between the steel constructor and the company responsible for the concrete. Therefore, this involved more than continuously optimising construction processes: it also involved the use of lifting equipment to synchronise the lifting of all building components at the right time and in the right place. The special architecture of the international prize-winning project was a further challenge. Indeed, there is not a single perpendicular wall anywhere in the six fully curved construction sections. This results in original and impressive spaces and an atmosphere which leaves a mark on visitors. As a whole, the elaborately designed building emanates harmony with an immediate invigorating and harmonising effect on the immediate surroundings. All interior walls in the 'House of peace' are made of heavy-duty triple glazing. They bring the building light and transparency – in both senses of the word. 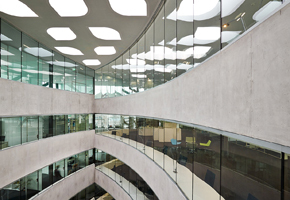 Because they create a visible connection between the individual construction sections and therefore promote social exchange amongst up to 3000 people who work here. The trendsetting complex is home to five organisations under one roof: the Graduate Institute of International and Development Studies (IHEID), the Centre for the Democratic Control of Armed Forces (DCAF), the Geneva Centre for Security Policy (GSCP) and the International Centre for Humanitarian Demining (GICHD). 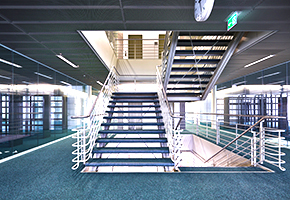 The building offers everyone the space required to fulfil their mission. Zurich Leutschenbach. Up until recently, the vision of the district was low-rise industrial buildings. This impression has now completely changed, however. Today, a very broad mix of office buildings and housing developments has transformed the area into a new, attractive district. An important part of this development is Andreaspark, once a purely commercial and office location that Steiner has developed into a new district. Andreaspark's largest and highest building is the SkyKey. Its completion in October 2014 rounded off the successful development of Andreaspark. SkyKey is northern Zurich's new, impressive landmark bringing new impetus to the district. Even from a distance, the assertive architecture catches the eye with its imposing, 63 m-high commercial premises. 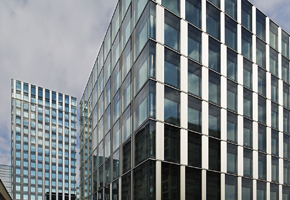 The 18 storeys house around 2400 office spaces – an impressive 400 more than Zurich's Prime Tower. Despite its impressive size, it remains elegant with clean lines. 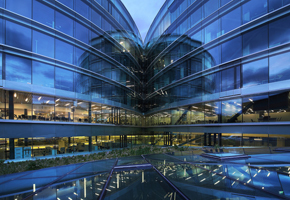 The building's impressive architecture is the work of internationally renowned Zurich-based architect, Theo Hotz, whose designs are technically, ecologically and economically distinctive. The SkyKey is impressive proof of this. This is because the building complex meets the highest level of LEED certification, the Platinum v2009 New Construction level, and is therefore at the forefront of the scene when it comes to sustainable building. 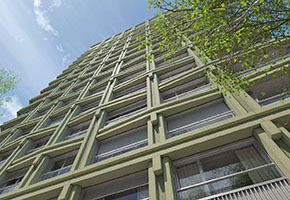 At the time of its inauguration, the SkyKey is Switzerland's only office building with this certification. The conditions of the LEED are stringent and comprehensive. Even when demolishing the previous building on this location, all material had to be recycled or disposed of by specialists. The SkyKey also received the pilot certification for the 'Swiss Standard for Sustainable Construction' – SNBS. The significance of these requirements can be seen in the SkyKey energy consumption alone: 50% reduction in electricity and 45% reduction in drinking water compared to a conventionally designed building. An impressive result and, for SkyKey marketing, a convincing argument. Thanks to the numerous benefits the striking building offers as well as due to its attractive situation, the Steiner development team was able to attract Swiss Prime Site AG as an investor and Zurich Insurance as the sole and exclusive tenant. 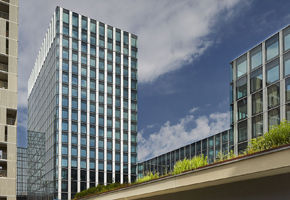 SkyKey is a highly modern business centre with ideal transport connections to the airport and the city of Zurich. 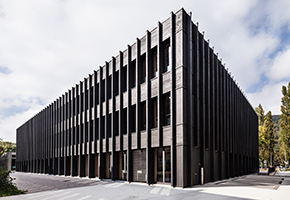 Northern Zurich's new landmark is also particularly significant for Steiner AG, as the striking building brings the curtain down on the sustainable development and realisation of the original Steiner property. The Urbahn project is an outstanding example of what innovative concepts and visionary thinking can do for a site's development. That is because Steiner AG's innovative project, the fruit of close cooperation with the city of Schaffhausen and the Economic Promotion Agency of Schaffhausen, has made a significant contribution to the development of Schaffhausen as a business location and to the attractiveness of the city as a place to live. The proactive development and multilayered structure of the new location transformed the area into a new, highly attractive district. The development has received the 2014 award for successful urban development by the Raumplanungsgruppe Nordostschweiz. High standard of living, central location and excellent transport connections: three factors which turn the new location into a multifaceted user spectrum. Every last detail of the complex has been carefully thought through. A hotel with modern conference facilities, two office and two residential complexes define the centre of the new development. The five buildings are laid out around a central piazza. It creates space for meeting opportunities for passers-by, residents, employees and visitors. Numerous businesses on the ground floor add the new dimension of a multi-faceted shopping mall. This mix of hotel, residential, retail and office space creates exciting synergies. The buildings were designed by the Zurich-based architects, Pfister Schiess Tropeano, who were already involved at the development stage of this project. Both residential buildings, with a total of 47 rental apartments, offer 17 different types of accommodation for different consumer tastes: 16 apartments with 2.5 rooms, 18 apartments with 3.5 rooms and 13 apartments with 4.5 rooms. Each one boasts a first-class profile, well-balanced room layout and excellent construction. South-facing room-high windows create bright and attractive living spaces. Controlled ventilation and triple-glazed wood-metal windows assure low energy consumption. Each individual apartment features a loggia, balcony or terrace and its own cellar section. Urbahn is a successful project in every aspect, setting new standards in urban development. 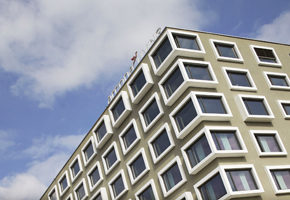 And which opens new perspectives – for users, Axa Winterthur as investor, and the city of Schaffhausen. 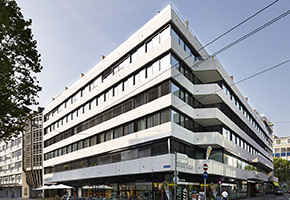 The renowned Residential and office building Anfos-Haus is one of the most remarkable examples of city architecture in Basel. With its minimalistic aesthetics it has a timeless modernity and an international appeal. Qualities to be enhanced by the renovation carried out by Steiner. 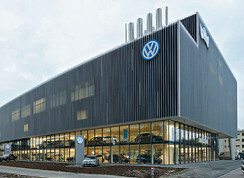 In 2008 Steiner was awarded the contract to renovate the building extensively. One of the most important requirements of this project is to preserve the historic character and structure of the complex. 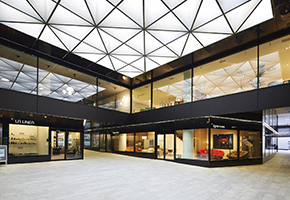 It is also essential to maintain the varied mix of uses, comprising retail, office and residential spaces. 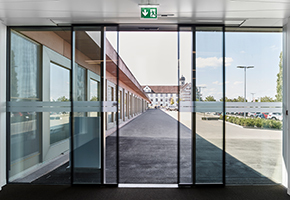 In conjunction with sabarchitekten ag Steiner develops a concept that emphasises the character of the building, improves its infrastructure and maximises its potential. Steiner is widening the three entrances to the passage and is accentuating them by creating a two-storey hall structure. Pillars and columns will form striking key elements to highlight the clarity and structure of the complex. Steiner adds a projecting glass canopy over the atrium and removes the first-floor passage. This gives the entrance an airy and welcoming appearance. The building's new structure means that the retail units will now occupy two floors. What is more, the residential spaces on the fifth and sixth floor will be more spacious: the 21 new 2.5 to 5.5 bedroom flats will look very impressive with a clear, modern aesthetic. Seven of these are designed as upmarket maisonettes. The office spaces between the first and the fourth floor will also benefit from the renovation because the new floor plans will enable contiguous letting across several floors. The impressive overall renovation is matched by the many smaller details which make this a unique building. For example, fittings for the sliding windows that have been developed by Steiner are installed and shall preserve the external appearance while also assuring optimum energy efficiency. All work is carried out by Steiner during normal working hours while normal business operations are progressing. The Anfos-Haus is an excellent example of long-term added value – from the start of the renovation to its completion and beyond. The Ecole Polytechnique Fédérale de Lausanne (EPFL), like ETH Zurich, is under the direct authority of the Swiss Confederation, i.e. the Swiss government. 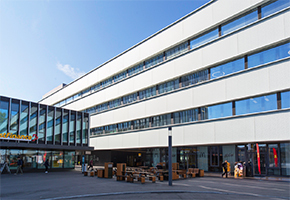 However, in contrast to Zurich, where the representative main building is still in the city centre, the whole of EPFL has been moved to a campus on the outskirts of the city. All departments have been located at Ecublens since 2002. A key part of the technical university is the former central library. It is one of five buildings that are being redesigned by Steiner in cooperation with the renowned architect Dominique Perrault. He created the legendary design for the French National Library in Paris. His idea: to give the building a lively, colourful exterior while creating a calm atmosphere inside with white panels and tinted windows. A task that is particularly challenging in view of the special design of the external façade. But the result is truly impressive - from the concept to the realisation. 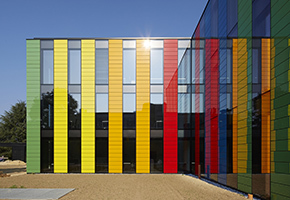 The new, colourful façade which is known on campus simply as the "bâtiment iPod", marks the entrance to a pedestrian and cycle thoroughfare. It links the Rolex Learning Center, the metro station and the new congress centre. The whole complex covers an area of 5,100 m2 area for approximately 180 people from the various administrative divisions. It also houses a post office and a restaurant. The large glass doors which open onto the terrace make the new building particularly welcoming. When the doors are wide open the boundaries between the outside and inside areas disappear, creating lots of space for people to meet and talk. Buildings in the healthcare sector have specific construction requirements and the same is true of "Projekt 3i". This is the very high tech-sounding name of a new operating theatre wing to be built at the Cantonal Hospital Münsterlingen. This is the first time in the history of the Canton of Thurgau that a total contractor – Steiner AG – will be managing such a project. The decision was taken based on Steiner's 40 years of experience in the design and build of highly complex constructions in the healthcare sector. In a collaborative partnership venture with the project managers of the Cantonal Hospital, Steiner is reconstructing and completely renovating the existing treatment wing. This will create new space for the urology and medical diagnostics departments as well as the gynaecological clinic. Steiner is also constructing a new, state-of-the-art building. The new building will accommodate the new operations department with ten operating theatres, the extended outpatient clinic for surgery and anaesthesia, the medical service as well as the central sterile equipment supply facility for the Canton of Thurgau. Based on the needs of the healthcare industry, the whole building is designed to facilitate efficient working procedures. All operating theatres as well as the pre-theatre and post-theatre recovery and transfer wards are housed on the first floor. This floor also includes the intensive care unit and the adjacent "Stroke Unit" for cerebral stroke victims. 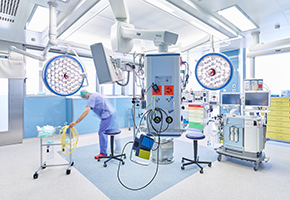 Steiner is commissioning internationally renowned specialist firms to install and equip these operating theatres. The theatres which feature cutting-edge technology are largely made of glass and offer no contact surfaces for bacteria. Sterile scrub-up areas between the operating theatres mean that breaks between any two operations can be reduced from 45 to just 15 minutes. An underground connecting tunnel linking all of the hospital wings and the helipad creates synergies and ensures optimum patient safety. The whole building will satisfy the strict specifications of the Minergie P Standard. This will make the Cantonal Hospital Münsterlingen a state-of-the-art facility and one of the most efficient hospitals in Switzerland. The complex to the west of Berne's railway station is one of Switzerland's most impressive construction sites. 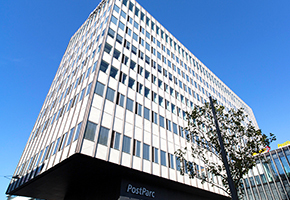 The whole area comprises three buildings located at right-angles to one another: the PostParc West on the site of the former Post- bahnhof, the PostParc Centre which is a new construction of the Schanzenpost and the redeveloped Post high-rise building to the east. Once they are completed, all three will satisfy the strict specifications of the Minergie standard. The PostParc was designed by the Berne architect Andrea Roost. His "Stadtcollage" project won the international design competition for the redevelopment of the site. His design is particularly impressive as it creates an attractive link between the railway station and the Länggasse Quarter. But while the centre is very impressive, the challenges it presents because of its inner city location are equally significant. Building a complex of this size in such a busy area means that it has to satisfy very strict requirements from the point of view of safety and construction site logistics. The dismantling stage gives Steiner many opportunities to demonstrate its professionalism in terms of organisation, logistics and planning. Steiner also has to adapt the base of the building and the roof construction of the SBB-Perronhalle to the new superstructures. Again, not an everyday task: protecting the environment during the construction phase. For this purpose, Steiner erects eye-catching wooden safety barriers. This is an expensive and time-consuming task but one that is worthwhile in every respect. At the end of 2015, some 130,000 visitors will pass through the urban centre and enjoy its balanced mix of 10,000 m2 of restaurant and retail space as well as 30,000 m2 of office space and medical practice facilities. As a hub between the railway station, the old town and the Länggasse Quarter the inviting ambience of the PostParc will attract a broad cross-section of the general public. The new construction will therefore tap the full potential of this prominent location. The project is a classic example of perfect coordination – even under the most challenging of conditions. The landscape is characterised by lines of poplars and isolated trees. Works of art create emphasis and reinvigorate the extensive open spaces. In the northern section of the site which is divided by the Schüss canal sit three cubes that house classrooms. In the southern section the school facilities include a gym. The Strandboden High School in Biel is one of the most important historic examples of the Solothurn School of Architecture. Its minimalistic style was created by the architect Max Schlup, whose design combines elegant lightness and stringent clarity. Steiner's task is to renovate, modernize and add a new building to the historic complex as a total contractor. This is a big challenge which requires a lot of respect for the existing structures and perfectly-coordinated organisation. 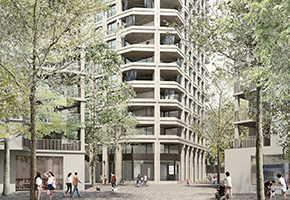 In close cooperation with the project managers of the canton and the architect, Steiner will gut the three wings of the building that are connected by underground passages and will redevelop them with the utmost care. After the work is completed, the basement floors will comply with the Minergie redevelopment standard whilst the upper floors will comply with the Minergie new construction standard. The gym will only be partially redeveloped. 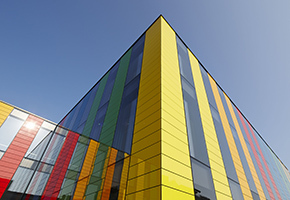 New façades with multiple glazing, automatic shutters and CO2-powered ventilation will improve the energy efficiency of all parts of the building. Steiner will also be replacing the building services. A two-storey new construction next to the existing sports building will complete the building composition. The building extension will comply with the strict specifications of the Minergie P Eco Standard – something which is remarkable for a wooden building. Its appearance will reflect the architectural signature of the existing building. It will offer space for 25 state-of-the-art classrooms and laboratories for natural sciences. It will also serve to bring together two High Schools which merged to Seeland High School in 2005 under one roof. Steiner will carry out all of the work during school term time which represents a significant logistical and operational challenge. The Strandboden High School project in Biel will not only serve as an outstanding model in terms of urban planning but also in terms of energy and architectural design. The following properties are currently being commercialised. Additional information can be found on the relevant project website, which you can view by clicking on 'More'.